Humpback whales will sometimes become curious and swim to within inches of boats and gaze upward at their human admirers. 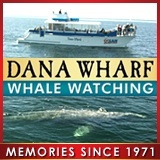 The footage shows the proximity of the whale to Lawler’s boat, its graceful movements, and its continued curiosity. Lawler, who runs Newport Coastal Adventure, said that at no time did he touch the whale. Viewers might be envious, but there are bound to be critics since it’s a violation of the Marine Mammal Protection Act to harass whales, or cause noticeable changes in their behavior. Lawler, who remained within touching distance of his boat throughout the brief encounter, claims not to have harassed the whale, which could easily have abandoned the vessel if it had been bothered. "My intention was not to approach the whale, but to simply float alongside of the boat while the whale circled us" Lawler told me. "To be able to watch the animal underwater gives an appreciation for its size that can't be judged otherwise."